I was immediately enchanted when I spotted the bundle on page 21 of the new Holiday Catalog. And it zoomed right to the top of my Wish List. 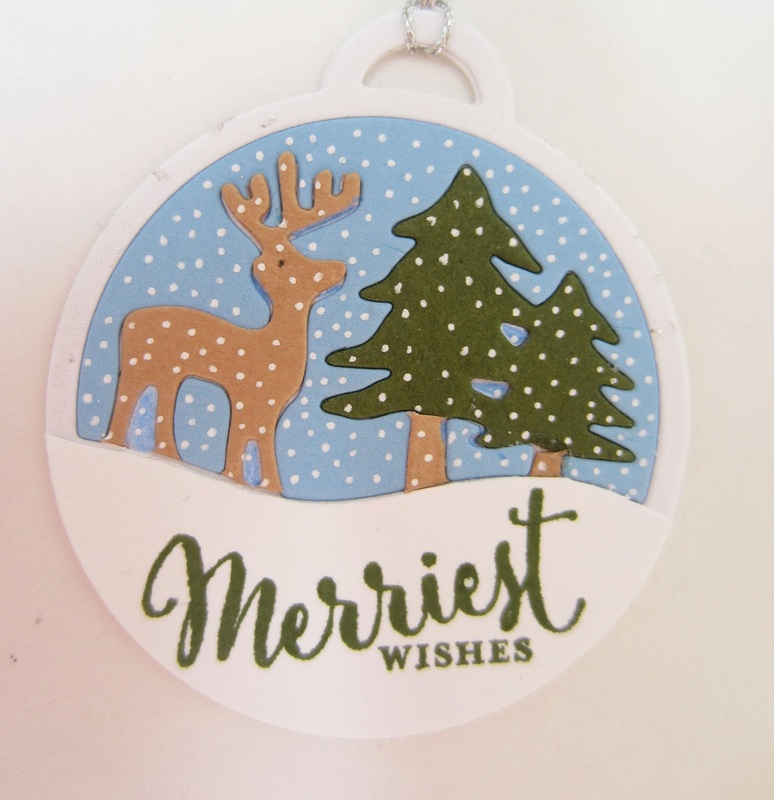 The bundle, which consists of the Merriest Wishes Stamp Set and the Merry Tags Framelits Dies, is meant to be used more in the tag category. If you take a look at the four wonderful projects the Stampin' Up! designers have come up with on page 21, I think you will be equally enamored. 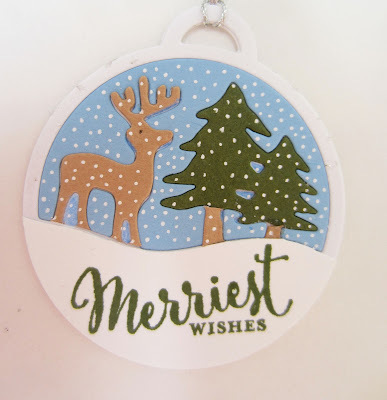 While the bundle makes adorable tags, I wanted to try my hand at using the components to make Christmas ornaments. The size of the finished ornament measures 2". So, they aren't overly large, just a nice size to add some charm to any Christmas tree. I know lots of demonstrators and crafters have great, innovative ways of storing their dies. I, however, am not quite so organized. What I worry about most is losing one of the teeny tiny dies. So, lately anyway, I hit upon a pretty good idea --- at least, for me. As soon as I get a new Framelits or Thinlits set, I cut out each of the pieces and mount them in an orderly fashion on a contrasting piece of cardstock that is cut exactly to fit inside the original packaging. I have this showing on one side so I can see exactly what the set contains. It is also easy to spot if you are missing any of them. Then I just throw the Framelits/Thinlits in the other side of the envelope. Organized, eh? Well, it works for me! Anyway, that is what you see on the left in the following photo. 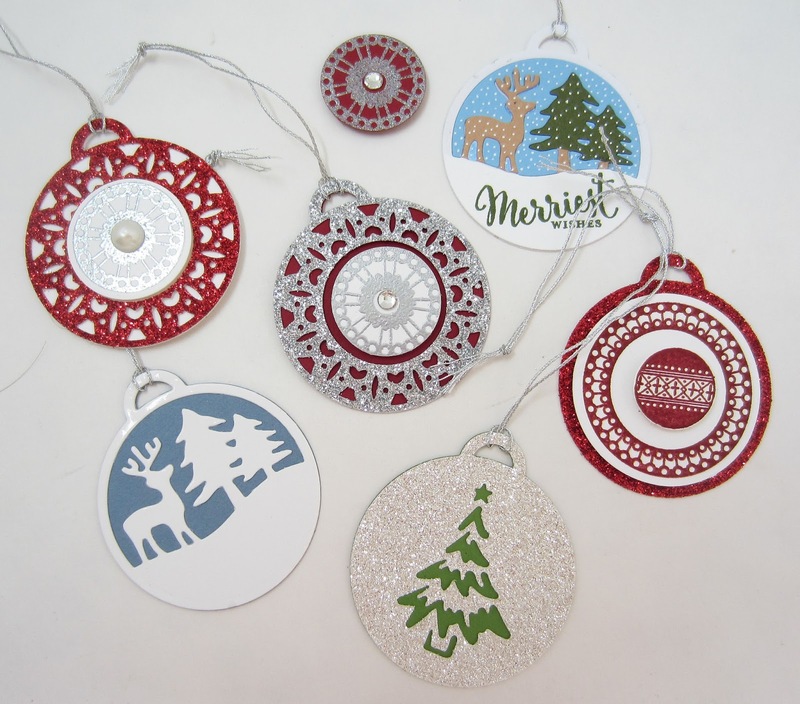 I used Glimmer Paper (page 175) on most of these ornaments. 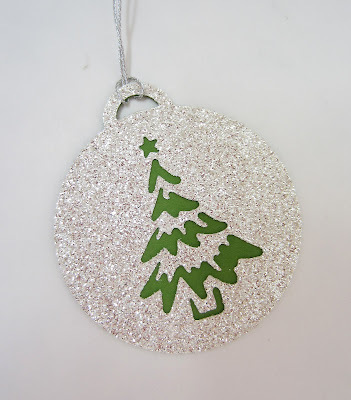 The one shown below is very simple, and incorporates Dazzling Diamonds Glimmer Paper, along with a scrap left over of textured Gumball Green cardstock underneath. Very quick to put together, especially if you need many of them! This one involves a combination of stamping and the Red Glimmer Paper. 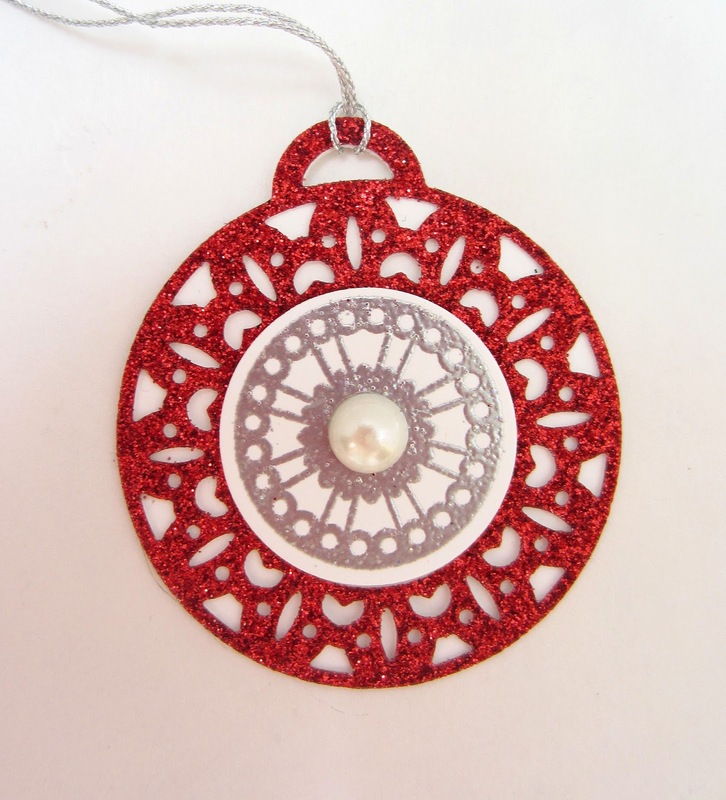 I popped the small ornament in the center up with a Stampin' Dimensional, as well as the large white circle on top of the Glimmer Paper ornament. 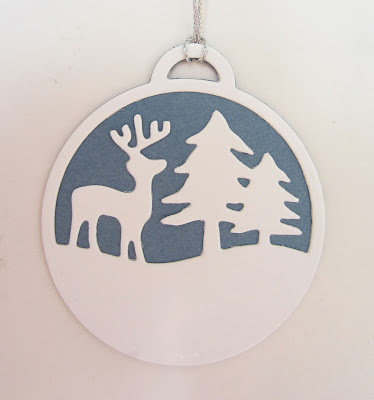 This one is also very easy to create, just two quick runs through the Big Shot, once with white cardstock to cut out the deer scene, and once more to cut out the ornament shape in blue cardstock. Then it's just a matter of gluing the two pieces together and adding a hanger. Quick, easy and cute! This next one involves a bit more time and effort. The bottom layer is, of course, created of Red Glimmer Paper. Don't you just LOVE the detail in that outer edge? To create the center, however, I did something a bit weird. Because the Red Glimmer Paper was ever so SPARKLY, I wanted to follow through with that sparkle in this piece. The silver embossing powder doesn't have quite the twinkle that I was looking for. So, I grabbed the old container of Iridescent Ice Embossing Powder (See? Save and USE your old retired product! ), and, in a separate container, I dumped a little of the Silver Embossing Powder and added some of the Iridescent Ice, mixing it well. Then, that's the concoction I used to emboss. It wasn't quite as sparkly as I'd wanted, but, if you hold it at the right angle, it does shimmer more than Silver Embossing Powder alone would. So, I guess I would call this a "near success". Better than a FAIL, huh? I added one of the giant pearls from several years ago to the center, and I am a happy camper! Now, I need your help with the next two ornaments I have pictured That pretty outer edge is created this time with the Silver Glimmer paper and is laid over an ornament of Cherry Cobbler cardstock. When I came to the center of the ornament, I just could not make up my mind. 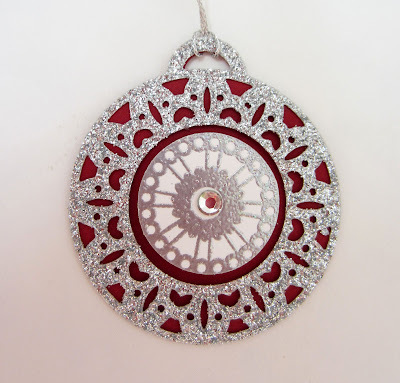 The first photo shows the center medallion made with my Silver/Iridescent Ice Embossing Powder combo with a Basic Rhinestone in the center, all done on Cherry Cobbler cardstock. This one is done the same way, but on Whisper White cardstock. Now, be honest! Which of the two do you think is the most effective -- or lovely? I have that center piece just lying on top of both ornaments. That will explain my last photo of this blog post. The following ornament is, I think, my favorite of all of them. However, I WILL NEVER DO THIS ONE AGAIN. It is all pieced. Do you see that? I actually cut it out four times. Once for the white outline, once for the deer and the tree trunks, once for the tops of the trees, and once for the blue sky. Whew. Even after all that, I was not all that thrilled with the results and set it aside, crabbily. When looking at it later, I thought maybe snow would help. So I used the white gel pen to add snow across the scene. It was an improvement, but still not great. The foreground looked much too, well, WHITE. So, I grabbed my container of fake snow from several years ago. It had never been opened. I added this strange mica snow to that foreground. And, YUK!!! After it dried, I scraped off as much of it as I could. But, I couldn't get it all off, so it was set aside once again. So frustrating! 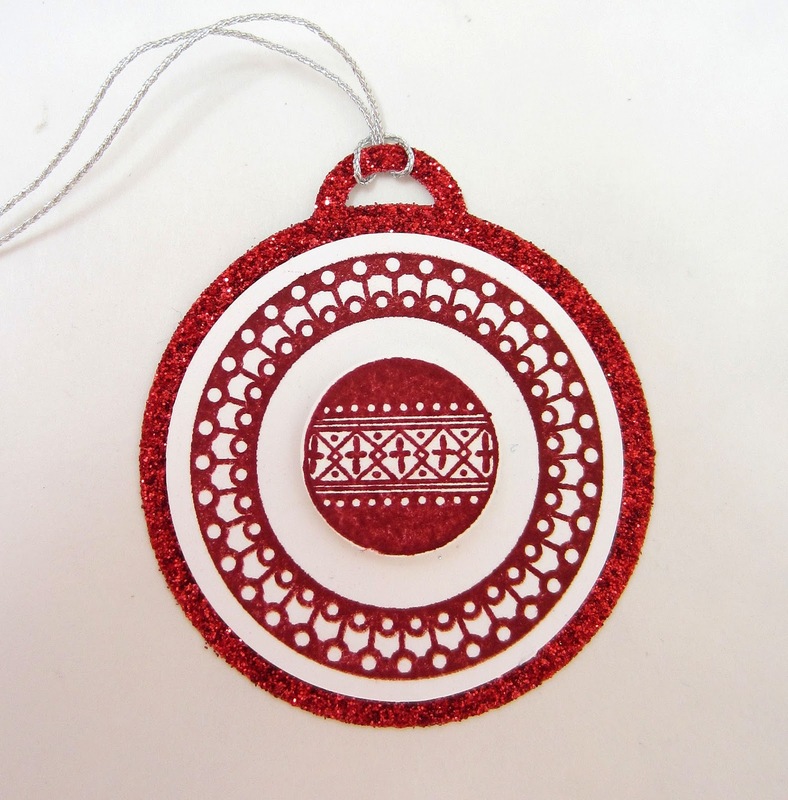 The other day, when I was making these other ornaments, I came across that pitiful thing again. After all that piecing work, I just could not throw it away. So, once again, I cut a white piece and trimmed off just the white foreground and glued that over the first one. There I was back to the plan white foreground that was SCREAMING (you can't imagine the NOISE a screaming ornament can make!) for something else. After peering into the case containing the stamps from the bundle, I spotted the perfect solution. And you can see the pleasing results below. Here is the whole family together. You can see the separate little red medallion on the very top. Remember now to let me know which of the looks you prefer! Oh my gosh these are so cute! Thank you for sharing with us at the To Grandma's House We Go link party! Pinned! Hi Linda, Your creations are always so pretty. 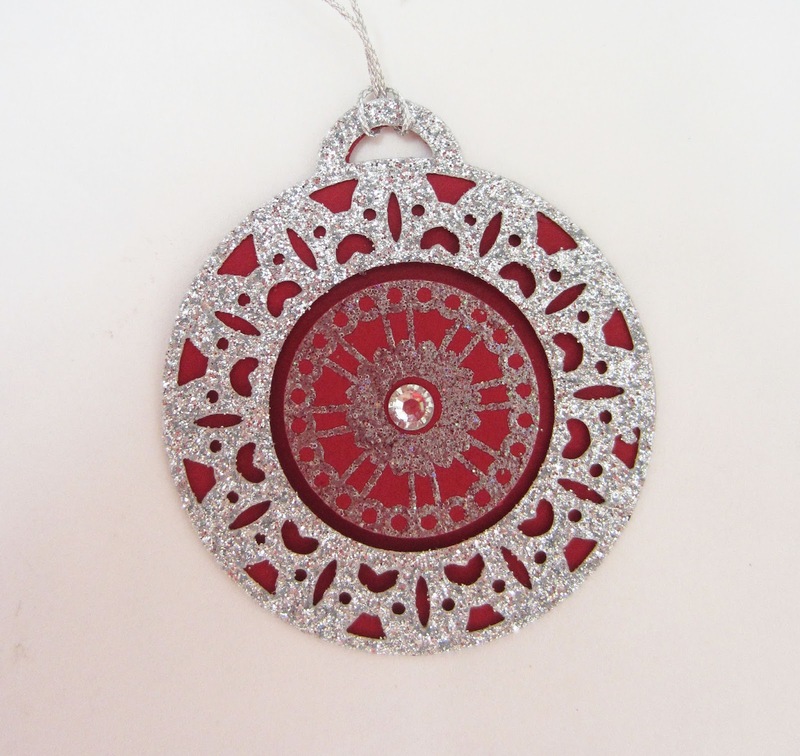 Your Christmas tree will look beautiful adorned with these! Lovely work as always, Linda! What lovely Christmas ornaments, although I'm not quite ready for the holiday season, but it's always great to plan in advance and know what to make for when the tree goes up! What a great Christmas theme! I would use them as gift tags!! Pretty! Thanks for sharing on My 2 Favorite Things on Thursday! Pinned! Thanks so much for linking up to #FridayFrivolity! Oh I just love this idea! HOW cute! !